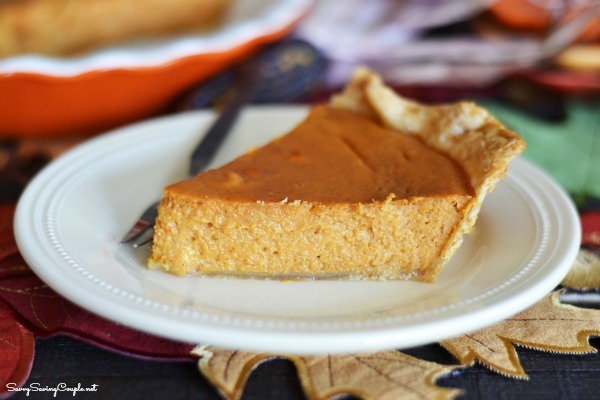 Home » The Best Shortcut Pumpkin Pie Recipe! 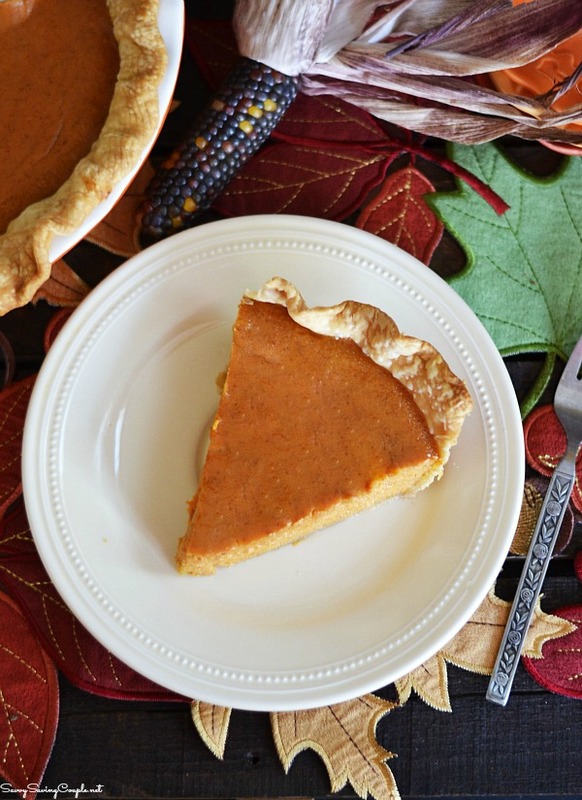 The Best Shortcut Pumpkin Pie Recipe! Pumpkin pie, apple pie, custard pie, and chocolate cream pie; I am surprised I haven’t turned into a piece of pie yet! I guess you could certainly say that I have been on a fresh-baked pie kick lately. I have been trying to work on making my pies a heck of a lot neater looking, and it is a slow process but I am getting there! 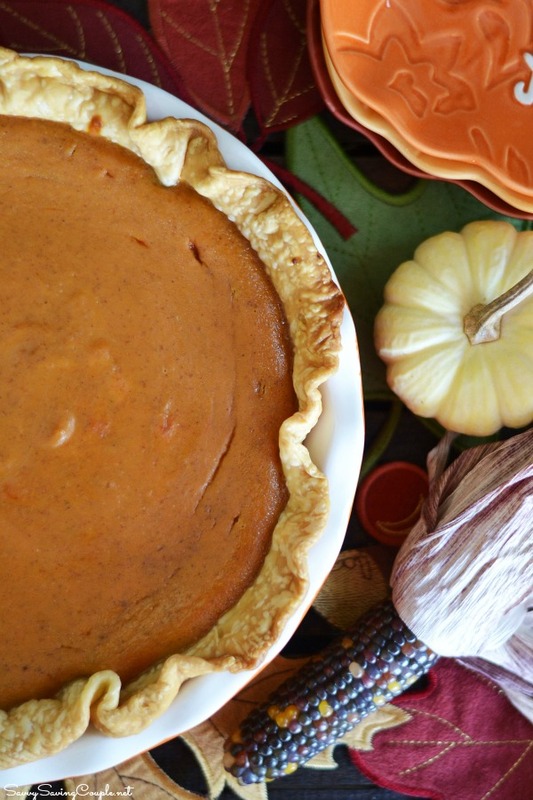 This latest shortcut pumpkin pie recipe was doubled, but I’d love to share it with you today. Soon, Halloween will be just another day past and you all are gonna want to head to the kitchen for some holiday baking. You might even want to turn those cute little porch pumpkins into pie. 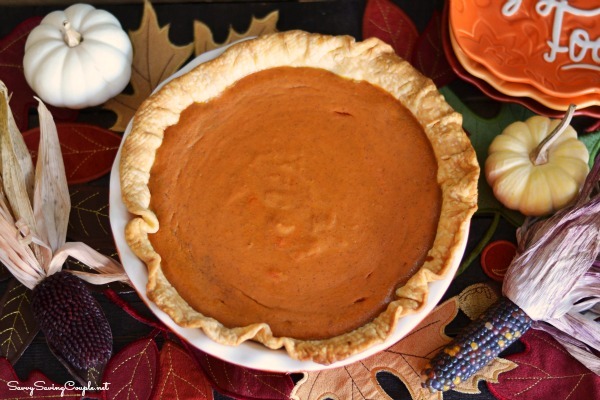 I recently made some fresh pumpkin pies from my son’s pumpkin (a whole other story), but this recipe is a shortcut one so it is much easier! I like to call this The Best Shortcut Pumpkin Pie Recipe because I used pre-made dough, and canned milk and pumpkin. I am not big on canned goods, but for pumpkin pies I make an exception. 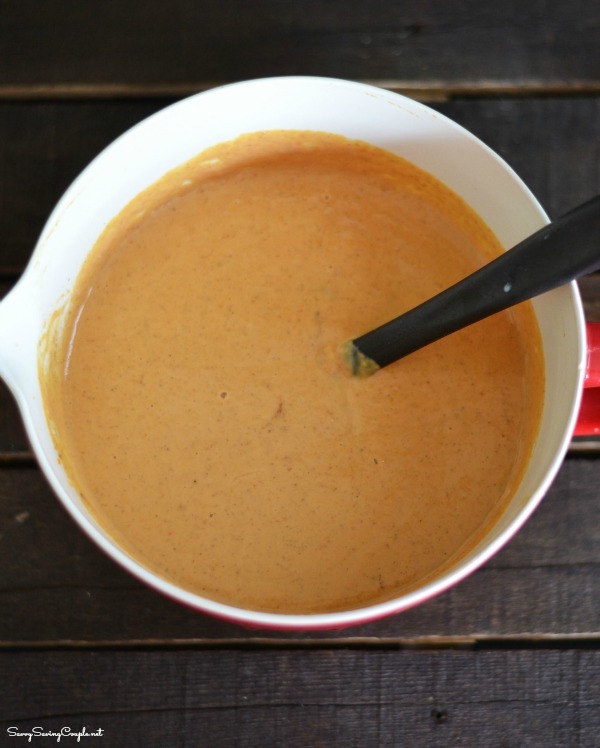 I love this recipe because you only need sweetened condensed milk, canned pumpkin, eggs, pre-made dough and pumpkin pie spice-easy enough? 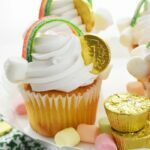 Plus, this time of year is perfect for getting these ingredients on sale! My husband loves pumpkin pie so much so I like to make one every week because it really isn’t hard. I whip up the ingredients so fast, crimp my pre-made pie shell, and then make some foil strips to protect the crust from burning. Pie shields are an important part of pie making because without them the outer crust can easily burn if it is exposed to the heat too long. We all know some pie fillings take longer than others so this ensures a deep golden brown crust but not a burnt one. Cook for 15 minutes at 425 then add the pie shields and cook for another 35-40 minutes. You will notice the pie might be a bit cracked on top but that is fine! 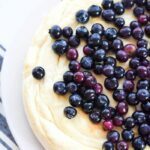 This pie is perfect for Thanksgiving and is best served with some vanilla whipped cream, and topping! Sounds delicious to me. We ALWAYS have pumpkin pie for dessert when we host Thanksgiving. 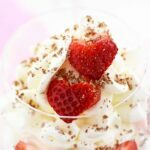 This looks delicious- I think I’ll try this for the holiday this year! We did pumpkin cheesecake last year but it was pretty expensive and time consuming to make. 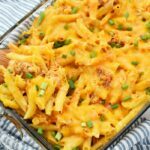 We have so much going on in my house on Thanksgiving, so this easy recipe would be a great break. It seems simple yet Delicious. It is beautiful. Everyone loves a shortcut especially with such pretty results! 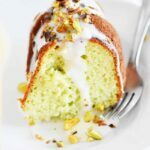 Ooh, I’m a sucker for anything with sweetened condensed milk in it! 🙂 I don’t love pumpkin, but I’d definitely be willing to try this out! What a gorgeous pie!!! I will be trying your shortcut for Friendsgiving next week! My husband is going to love that I found that recipe. I may actually make him a pumpkin pie now! Pumpkin pie is one of my all-time favorite desserts. 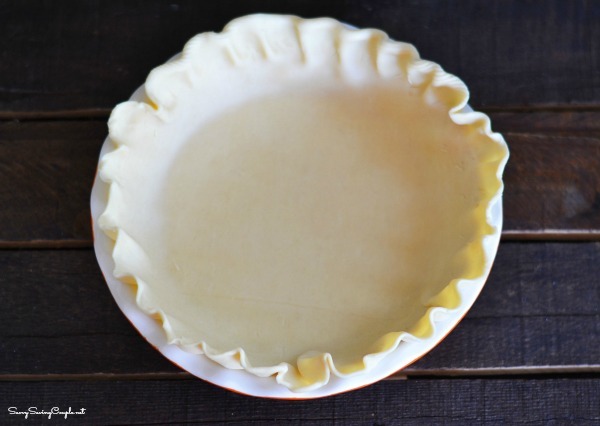 Your pie looks delicious….I love the way you crimped the crust around the edges for a wonderful rustic effect. OMGosh! Your recipe is very similar to mine except I add in a little extra cinnamon (I love cinnamon). My kids love pumpkin pie and I enjoy making it every year! Yum, your pumpkin pie looks so good! I love trying new pumpkin recipes during the fall season.